This spring’s flooding showed why the remedy used for heavy metals contamination along the upper Clark Fork River will likely be needed at the former Smurfit-Stone pulp mill site downstream from Missoula. Heavy May rains combined with meltwater from a record winter snowpack to swell the Clark Fork to levels that hadn’t been seen in 110 years. The river stayed high for weeks, flowing with enough force to carry sediment and logs that bumped along the banks and the river bottom. When the water finally receded, the river channel was noticeably changed. But such is the manner of free-flowing rivers – their course is rarely set in stone. John DeArment has taken note of those changes while sampling Clark Fork River water for the Clark Fork Coalition, where he is the science director. The most noticeable change is between Clinton and Turah, where the river abandoned a side channel. Unlike some parts of the Clark Fork that are forever confined between the railroad and interstate highway, the river has a wider floodplain in which to move through the Clinton area. It’s also more heavily forested so it has more dead wood floating through to gouge the channel into new directions. In the middle of Missoula, the gravel bars around Brennan’s Wave have also changed, causing the water to flow a little differently at times over the manmade wave. While the high waters contributed, DeArment said it’s not surprising that Missoula might get more gravel deposits because more sediment is carried downstream, thanks to the removal of the Milltown Dam a decade ago. Prior to that, sediment settled above the dam. 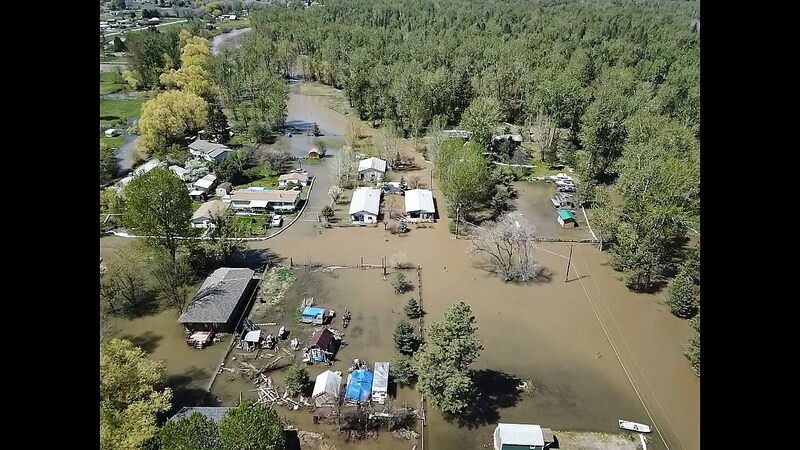 While DeArment knows it’s normal for a river to shift its banks, some of the banks of the Clark Fork aren’t normal, so they can cause problems. Such is the case in sections of the Upper Clark Fork near Deer Lodge and Galen, where contamination from Butte’s copper mines – including lead, arsenic, cadmium, copper and zinc – still lurks in the soil. The flood caused noticeable changes that have DeArment concerned. “Where remediation hasn’t happened, the high water definitely had some impact and removed some materials. It points to the pressing need to get that stuff hauled out of there as soon as possible,” he said. The Montana Department of Environmental Quality intended to have the sediments removed a year or two ago as part of the Superfund cleanup of heavy metal contamination along 44 miles of the river. But after working on three sections upstream, DEQ worried that it might not have enough money left from a $98 million settlement that the Atlantic Richfield Co. agreed to pay in 2008. This fall, the agency will return to clean up a 2.6-mile stretch near the Grant Kohrs Ranch northwest of Deer Lodge, which it anticipates will cost $10 million to $20 million over the course of two years. But that will leave an untreated 20-mile stretch in between. If next spring is a repeat of this year, the river might pull more contaminants from those banks. DeArment pointed out that the upper Clark Fork isn’t the only section that poses the threat of contamination: The former Smurfit-Stone mill site is also a potential problem. Residents of the Missoula Valley were alarmed this spring when it appeared that floodwaters might have breached a berm along the former linerboard plant’s settling ponds. Subsequent sampling revealed that harmful contaminants hadn’t entered the river, but DeArment says that doesn’t mean it couldn’t happen with subsequent flooding. The Environmental Protection Agency is developing a sampling plan to learn how far contamination extends beyond the Smurfit site so it can decide where and how to conduct cleanup operations.